There was no way this photo wasn't going to happen. A TRIKE is not the most inconspicuous of rides. 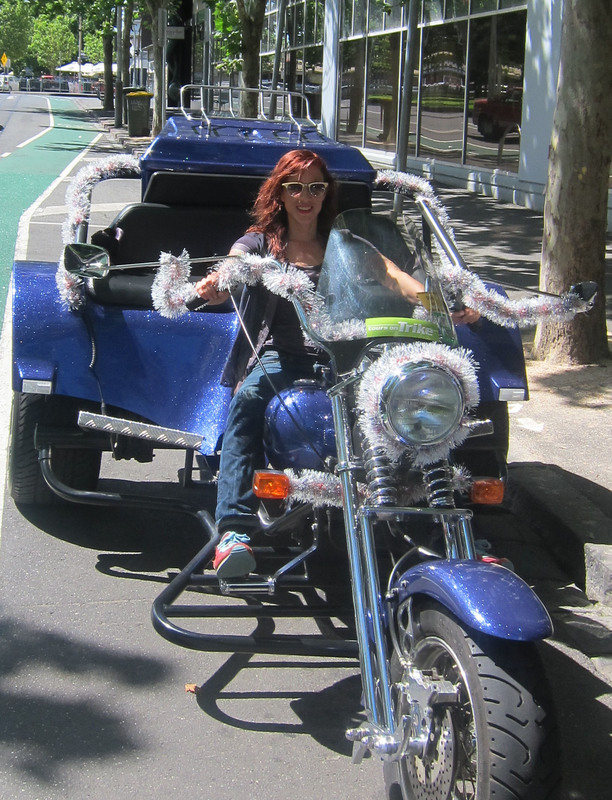 Mine, from Tours on Trike arrives shining like a pre-pud sixpence and draped in tinsel. Perched atop the back seat, I feel like Santa on his sleigh. I must look like him, too, as everyone’s grinning at me. I thought Melburnians were too cool to register surprising sights? The Chopper 4 is a car/bike hybrid. Powered by a rear-mounted Volkswagon engine, it has a car’s gearbox and brakes, with a motorcycle’s throttle. My tour guide, Alex, is leathered up like a biker (he gets about on a Suzuki in his spare time), and needs a bike licence to drive the machine – yet, he explains, he also needs a car licence to carry passengers. These ‘threedom machines’ were designed and built by OZ Trikes out near Gosford, NSW, crafting up to 80 a year. The man behind them is Johann Kastner, a German expat who became a paraplegic after a biking accident and wanted to get back on the road, safely. The trike’s low centre of gravity and 19″ rear tyres make it impossible to tip over, even if you did follow the speedo all the way up to 220 (“that’s a bit optimistic,” Alex admits with a chuckle). So, while being perched up high you feel as though you might take flight at the slightest sight of a loose stone, particularly when hooning over Bolte Bridge, you can try and ‘help’ the driver steer as much as you like with no effect. While there are a choice of tour routes, a customer can also request their own, with prices starting at $99 per person for an hour. Like all the best guides, Alex imparts his favourite oddities behind the sights as well as the approved historical accounts, communicating through a headset. We take in Flagstaff Gardens (once the highest point in Melbourne, the site of Victoria’s first playground, and home to Melbourne’s oldest corpses), Vic Markets (9000 bodies still lie in the former cemetery after only 1000 were disinterred), contemplate the design faults of the Etihad Stadium and the design curiosities of the Goods Shed and Mission to Seafarers building, and admire the Royal Exhibition Building, erected to host the Melbourne International Exhibition in 1880-1881, which is why a lot of other buildings popped up in these years. 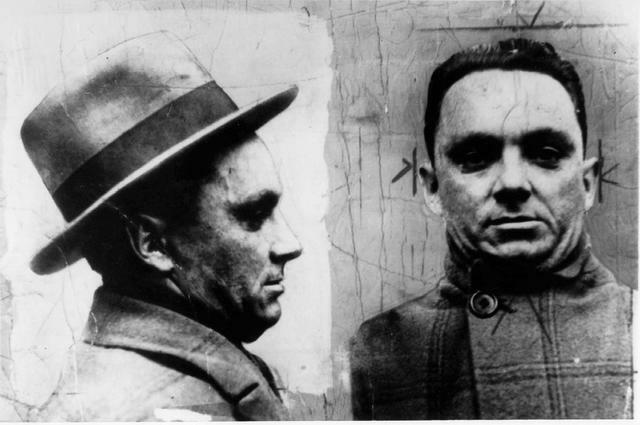 Ned Kelly’s armour is housed on the fourth floor of the State Library, I’m told, while Prohibition-style gangster Squizzy Taylor (he had a squizzy eyelid and walked with a squiz), got up to no good at Trades Hall. He also used to drink in St Kilda’s Village Bell, which comes as no great surprise. Keeper? Wouldn’t mind trying out the Grand Prix route.